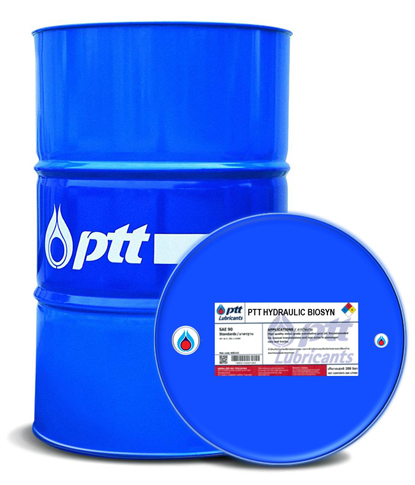 [PTT HYDRAULIC BIOSYN] น้ำมันไฮดรอลิกอุตสาหกรรมชนิดสังเคราะห์ ซึ่งมีจุดเด่นในเรื่องของการย่อยสลายได้เองตามธรรมชาติประเภท HEES (Environmentally acceptable hydraulic fluids: ISO 15380) ทำให้สอดคล้องกับข้อกำหนดและมาตรฐานด้านสิ่งแวดล้อม EPA Vessel General Permit (VGP) Premium grade fully-synthetic hydraulic fluids that provide unique ability for biodegradability. They are classified as HEES fluid (Environmentally acceptable hydraulic fluids: ISO 15380) which conform to EPA Vessel General Permit (VGP). They also offer superior anti-wear protection along with high viscosity index to achieve maximum efficiency in all temperature conditions and proficiently resist oil degradation and deposit formation to extend oil drain intervals. • Designed for industrial hydraulic systems which operate in wide temperature range and environmentally sensitive areas where ISO HEES category hydraulic fluids are recommended. • Recommended for marine applications requiring environmentally acceptable lubricants (EALs). • Provide low environmental impacts and high biodegradability more than 60% by OECD 301B.